Poodle skirts, crew cuts, soda pop, and rock 'n roll! Fournier's Ballroom in the 1950s and 60s was the regional hot spot for entertainment. Longtime area residents still speak fondly of their memories of northwestern Wisconsin's largest dance floor where sometimes over 1,000 enthusiasts would be - in the words of the time - "rockin' and a rollin', boppin' and a strollin' at the hop!" World-class performers of the Fabulous Fifties included Conway Twitty, Bobby Darin, The Everley Brothers, Del Shannon, and Gene Vincent. Best remembered is the Winter Dance Party of January 26, 1959, when the legendary Buddy Holly, Ritchie Valens, the Big Bopper, and Dion & The Belmonts shared the stage. A week later, Holly, Valens, and the Big Bopper died in a plane crash after playing the Surf Ballroom in Clear Lake, Iowa. By the 60s skirts were shorter, hair was longer, and popular bands included The Thundermen, The Intruders, The Showman, The Shandells, Doc and the Interns, Crosstown Trafficque, The Renditions, Stormy Monday Blues, Carnaby Street, and The Exchange. Mickey Lynnes of The Thundermen remarked that, "Playing at Fournier's meant you were the best in town." Much earlier, Fournier's hosted some of the biggest names of the big band era including Glen Miller, Tommy Dorsey, Guy Lombardo, Wayne King, and Lawrence Welk. Regional and local bands playing the big band sound and polkas included such performers as Frankie Yankovic, The Six Fat Dutchman, The Rhythm Playboys, The Frank Switzer Orchestra, and The Howie Sturtz Orchestra. Local bandleader, Conrad Johnstad, was drawn to Fournier's even as a boy. One memorable day in the late 1930s, he stood alone by the bandstand. The trumpet player beckoned, "Come here, boy," and seated him next to the drummer. The trumpet player? Louis Armstrong! Opened by Wenceslas (Mons) Fournier around 1900 as Fournier's Dancing Academy and Ballroom, the facility catered to formal events during the first 25 years. Prior to Fournier's, the circa 1887 building had been home to such enterprises as Griffin Rifles Armory from which soldiers departed the City for the Spanish American War. After the death of Fournier in 1926, the business was left in trust to Lou Fournier, whose driving spirit and love of music brought success to Fournier's Ballroom until her death in 1968. By the 1970s, advancing technology gave society more entertainment options and the popularity of ballroom dancing waned. Fournier's Ballroom closed its doors February 27, 1971, and by December the building was gone. For many, Fournier's Ballroom lives on in memories of meeting friends in a very special place and dancing to the rhythms of their favorite bands during a star-dusted time when it seemed as if the whole world was young and in love. 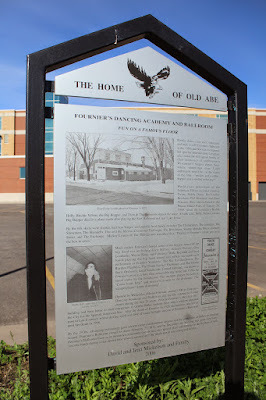 The marker is located adjacent to a parking lot on southbound 1st Avenue, just south of its convergence with 2nd Avenue, Eau Claire, Wisconsin 54703. This marker is No. 10 in a series of markers erected by the Eau Claire Landmarks Commission. Looking north along 1st Avenue . . . Looking across 1st Avenue at the Chippewa River. 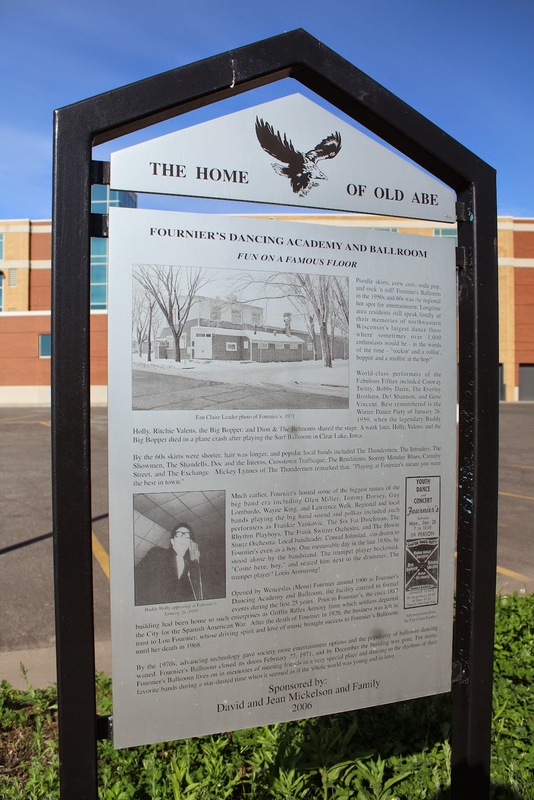 The marker is located in Historic West Grand Avenue.